Roughly four months after the release of the popular multiplayer shooter's last hero, Hammond (an intelligent hamster in a giant ball mech), Blizzard is already teasing Overwatch's next hero: Ashe, the "rebellious" female leader of the fictional "Deadlock Gang." Blizzard's timing couldn't have been better with this reveal. The internet (including a couple of our writers) is already in a western mood thanks to the recent release of Red Dead Redemption 2, so more wild west content will undoubtedly come as a timely, and welcome surprise for Overwatch's fanbase. Unlike most other characters in Overwatch, it seems like Ashe's primary weapon -- a semi-automatic rifle named "The Viper" -- can be aimed via iron sights or hip fire. The only other heroes in the game that have this ability are sniper-wielding specialists like Widowmaker and Ana. Unlike those two, though, Ashe seems to retain much more of her situational awareness and mobility while aiming. Her impressive-looking rifle aside, Ashe also has access to a throwable stick of dynamite, which can be detonated manually by being shot or automatically after a short delay. She also has a "Coach Gun," which lets her essentially rocket jump or merely propel enemies backward a few feet. Like any other Overwatch hero, Ashe also has access to a powerful-looking Ultimate ability. Upon using hers, Ashe summons "B.O.B.," a robot sidekick who charges into enemies, knocks them into the air, and then "lays down suppressing fire" with his built-in arm cannons. 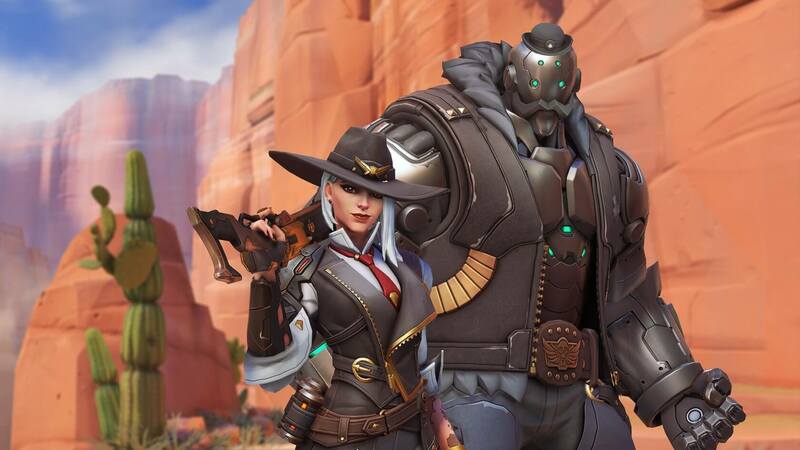 We have no clue when Ashe is arriving in the main game, but new characters usually make their way to Overwatch's "Public Test Realm" (an opt-in beta server) a few weeks after they're first revealed.